Thank you so much for making our beautiful, delicious cake for our big day on 19th April 2014! We were so delighted with everything - the communication, our meetings with you, and the way you progressed our ideas to making this perfect cake was very professional but in a way that made us feel at ease with you! Such a wonderful lady and will recommend you to everyone we know! smile emoticon Thank you for all your hard work and delivering the most wonderful cake as the outcome! Red velvet & coconut and raspberry was scrumptious! wink emoticon I can't say it enough, but thank you from us both..!! Mr & Mrs Brett! Just a little note to say thank you for our delicious wedding cake Friday 5th December (Offley Place). Everyone has told us it's the best cake they have tasted and it's already all gone!!! Just a quick email to say thank you so much for the amazing wedding cake. Not only did it look absolutely beautiful, and completely fit the theme of the day, but it tasted fantastic and everyone was talking about how delicious it was! The chocolate cake was definitely a hit with all!! Im looking forward to the top tier of fruit cake now !Its my dad’s 70th birthday this year so may well be in touch for a Bday cake.Once again, thank you for your wonderful creation! "Just wanted to say a massive thank you for Rosie & PJ's wedding cake - it was absolutley amazing - everyone commented on how lovely it was, not only to look at but to eat :) I can't thank you enough for making such an amazing cake, Rosie was over the moon with it, it was exactly what she wanted." Hi ya Clair sorry I'm only just contacting you. Literally just got back from honeymoon. Just wanted to say thank you so much for my cake for my wedding. It looked beautiful and was very tasty to. I was really pleased with the outcome. I hope your well. "Now that we are finally back home and catching up, I wanted to say a big thank you for the cakes you did for our wedding and my Mum's birthday. They were both fantastic and there were lots of comments throughout the day about the fab wedding cake. The cake itself is gorgeous - so moist. We bought home the leftovers and they are still just as nice. Many thanks for everything." "Clair made my sons 3rd Birthday jungle theme cake, it looked fantastic everyone was impressed and the cake tasted amazing lovely moist sponge and generous filing. Would highly recommend and will defiantly be using her for future occasion cakes. (She is already booked for my wedding cake next year!)" "Your cake looked fab my little boys face when he saw his donkey was a picture, he loved it and wouldnt let me cut it for a day! It also tasted divine, your sponge was so moist, i normally dont like icing but yours was yummy as it had butter cream with it never tasted that before! Everybody that saw and had some of your cakes said was it was fab, most importantly my son loved it! Best of luck, I shall recommend you highly." "Clair made us a two tier engagement cake, we sent her a copy of the invitation and she matched the colour scheme and letter design perfectly from it. The cake itself was not only beautifully decorated it also tasted amazing. We would highly recommend Clair's cakes not only for the taste and design but they are also excellent value for money. Thank you once again Clair." "I wanted to say thank you so much for the cake you delivered to Loch Fyne on Saturday. It was absolutely great, my wife and our guests loved it and the decoration on it. It was exceptionally rich and tasty and plenty of people had seconds! Your help in making it just right was what I needed, it was there when you said it was and was just what was ordered"
"I certainly recommend Clair's Cakes. I have had the pleasure of seeing so many beautiful designs presented by Clair in person. I have also had the even more pleasurable experience of tasting them. Divine!" "Clair made our sons 18th Birthday cake and it was exactly what I ordered. It was very moist and full of flavour. 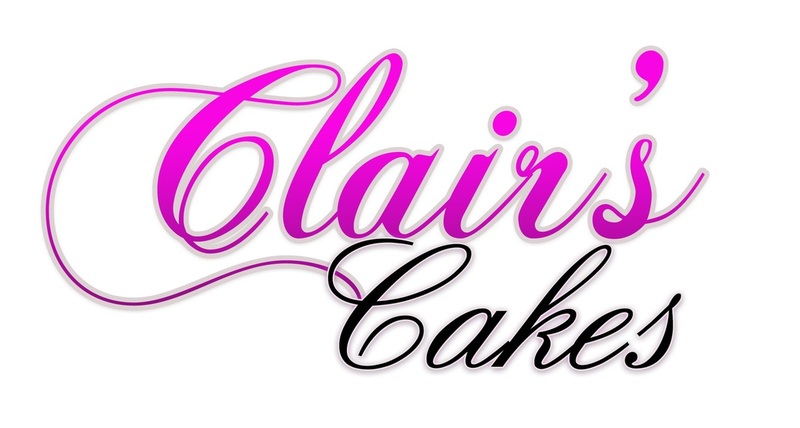 The best cake we had ever tasted and will certainly recommend Clair's Cakes and will be ordering again"
"We all thought the cake was absolutely fabulous, it was exactly as she wanted it and it tasted delicious too, thank you so much. Will definitely recommend to all friends and family in the future!! "Thank you so much for the beautiful cake you created for our wedding. We really appricated all your time and effort that went into creating our cake and especially the patience you had when I kept changing my mind! Your attention to details made our cake look perfect and it tasted delicious! We will certainly be recommending you to our friends in the future! Thanks again!